Impedance tuner? It is a guitar mod, which can help you tune the treble bleed of a guitar wiring, by adjusting the impedance of the circuit. Its a quite simple thing, based on a 1M potentiometer. 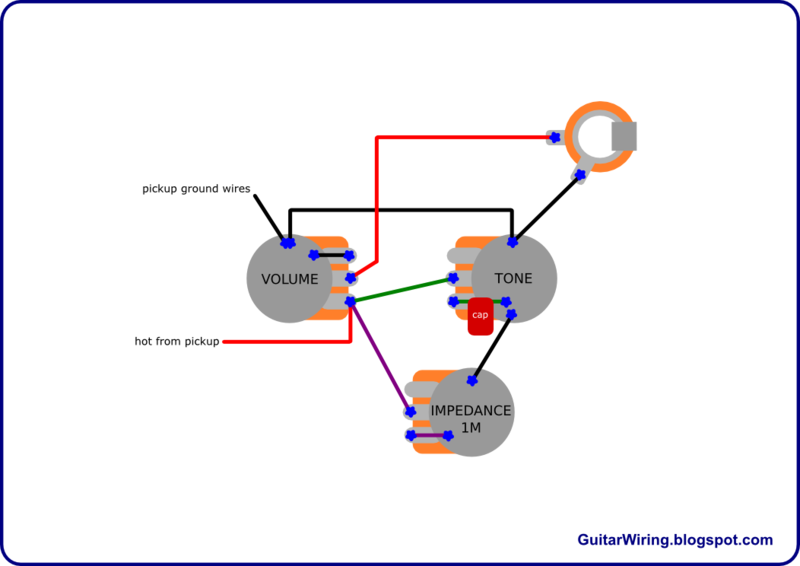 The diagram shows the example with the common volume+tone circuit. The mod can work with many other guitar wiring types also. It's working like a variable resistor, between the hot path and the ground. The more impedance is in this connection, the less guitar signal treble will bleed out. If you will turn down the impedance pot to maximum, your guitar will be completely quiet. The impedance will be so small, that the mod will start working like a kill-switch. If the turn of the knob will be smaller than ca 90% of the full turn down, the mod will just muffle some amount of the guitar treble. It not means, that it will be working like a common tone control. It's different, but it's also making the tone warmer/smoother. It will save more of the signal and frequency response will be quite wide. Your warmed guitar tone will be more transparent and natural, if you will use the impedance tuner instead of the classic tone control. I think, that for most of guitarist the impedance tuner will be really useful for rounding and smoothing the signal. However, for some guitar players, it can be good also as some kind of a swell effect maker, or some extra volume control, with a huge treble bleed. BTW, the potentiometer of the mod will affect a little the whole guitar wiring frequency response, even if it will be on „10” position. To minimize this effect, swap your volume pot for some higher value.